I began working on cars when I was 13 years old. When I was 14, I attended school for the automotive trade in Poland. On June 30th of 1967, I received my mechanics license diploma and one day later began working for a transport company fixing small and large vehicles. During my first 3 years there I spent my only day off obtaining my masters mechanics degree, which I completed in 1970. I soon left the transport company to join the college as a shop instructor where I stayed for 6 years. 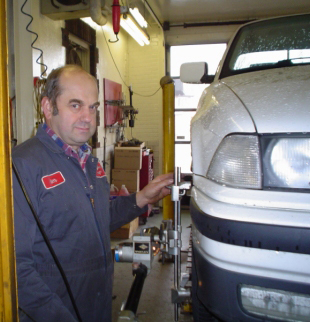 In 1976, I opened my first mechanics business while running a small transport company at the same time. In 1981, I heard a rumor of marshal law coming to Poland, so I escaped with my son to East Germany where I stayed for one year. During my stay I obtained all the mechanics certifications available there. I had always dreamed of coming to Canada for thee vast nature and opportunity in the country. With the help of my brother sponsoring me, I was able to make this become a reality and immigrated here in 1982. After one month of being in Oshawa I found a shop looking for a mechanic, it was Vanderheyden’s Garage. I remember the first day I started work; Bill asked me if I could put together an engine that had been over-hauled. It was a Honda Civic hatchback. There were parts all over the bench. By the end of that day I had the car running, so I was allowed to show up the next day to work again. In 1983 I completed the Canadian mechanics certification and I am still working on cars today. I could literally write a book about working here. I really enjoy working on cars. Every day is different; new problems and challenges and new ways of finding solutions. I enjoy working for Bill very much. I hope he is still happy as well.